Zimbabwe Airways, the controversial new state-owned airline being built with the help of aircraft retired by Malaysian Airways has lost one of the four Boeing 777-2H6(ER) aircraft that it had targeted. The aircraft, with registration mark 9M-MRL, had already undergone a paint job for Zimbabwe Airways livery. It suddenly flew from Kuala Lumpur to Kansas City, Missouri, in the United States on Friday. For the flight, its new owners - believed to be Jet Midwest - scratched off the "Z" and "we" in Zimbabwe Airways to leave it reading "imbab Airways". An official from the Ministry of Transport, speaking on condition they were not named as they were not cleared to speak to the media, told ZimLive that they had failed to pay for the plane. "The original plan was to buy four of the seven retired aircraft, but we have only so far managed to pay for two fully, and a third should be secured. The Malaysians sold off the fourth after payment dragged on," the official said. Zimbabwe Airways now remains with three of the B777s - 9M-MRQ, 9M-MRP and 9M-MRM which are all parked at the Kuala Lumpur International Airport in Malaysia. Of the three, 9M-MRQ and 9M-MRP already have Zimbabwe Airways livery - but there remains no date for the aircraft's delivery to Zimbabwe. Malaysia Airlines lost two of its B777s months apart in 2014 - one shot down by a missile over Ukraine and another which vanished off the radar and crashed into the sea through what investigators concluded were the deliberate actions of the captain. While the accidents were not the plane's fault, Malaysian Airlines could not believe their bad luck with the B777s and decided to retire them in March 2016. Zimbabwe negotiated to buy four of the planes at a total cost of $70 million. The Zimbabwe Airways' formation has been something of a scandal in Zimbabwe. For a long time, the government had claimed that it was a private company - before ministers finally admitted that the company was state-owned. The government had planned to hide its interest in the airline to avoid creditors attaching the aircraft. Zimbabwe Airways would have taken over overseas routes long abandoned by the ailing Air Zimbabwe, including Harare-London and Harare-Beijing. Transport Minister Joel Matiza announced recently that Zimbabwe Airways would be merged with Air Zimbabwe, but within days of that announcement, Air Zimbabwe went into administration. The administrator then announced that Air Zimbabwe, wholly owned by the government, was looking for private investors. The developments at Air Zimbabwe have raised new questions about the merger. 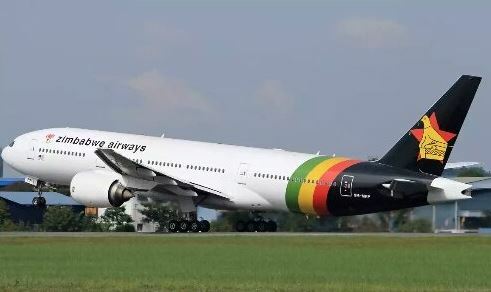 Last Friday, the Zimbabwe Independent reported that talks about merging the two airlines had collapsed after a nominee shareholder in Zimbabwe Airways demanded to be paid US$2 million by the government. Harare lawyer Phillipa Phillips, who is listed as a Zimbabwe Airways director, wrote to the Transport Ministry informing them that the merger would not proceed unless she is paid US$2 million. A nominee shareholder is an ostensible or registered owner who holds shares on behalf of the actual owner (beneficial owner) under a custodial agreement. It was not immediately clear who in this case the actual owner was. Former Transport Minister Joram Gumbo and former Air Zimbabwe COO Simba Chikore spearheaded the formation of Zimbabwe Airways. "In 2012, the government decided to declare Air Zimbabwe insolvent. When I came into the ministry, I was tasked with finding a partner for Air Zimbabwe, as well as unbundle the Civil Aviation Authority of Zimbabwe. I approached Ethiopian Airways. They told me that they could not partner us because we had bad books; they wanted to take over our routes but they did not want to do business with us. We also approached Kenyan Airways, Egyptian Airways, and the responses were all the same. We however got an encouraging response for Malaysia Airlines. We then travelled to Malaysia with the then President Robert Mugabe, who was going to Singapore for his health check-ups. In Malaysia, we met with their then Prime Minister Najib Razak who had a one-on-one discussion with our former President. Also in attendance were a team from Malaysia Airlines, PriceWaterhouseCoopers - who were responsible for selling Malaysia Airlines airplane - and our team. The negotiations were about buying or leasing airplanes from Malaysia Airlines. President Mugabe introduced me to Prime Minister Razak who said to me, 'Minister Gumbo do you have money?' and I said I did. And he said, 'If you have money, I am giving you four planes for US$70 million'. We accepted. Then President Mugabe left for Singapore, leaving us to negotiate. We could not agree because PWC demanded that we pay US$140 million for each plane. They said the offer made by their Prime Minister was made in jest. I insisted that he could not make such a joke in the presence of our President, it was not possible. Negotiations broke down the following day and I told them that I was informing my President that we had failed to agree and the Prime Minister had lied to him. Remember what happened to the two Malaysia Airlines planes in 2014? The negotiations were back on track and we were joined by the Reserve Bank of Zimbabwe Governor John Mangudya and former Finance Minister Patrick Chinamasa who were coming from the United States. A letter of intent was drafted and the RBZ was asked to authorise payment of US$7 million so that discussions could commence, and he did that. Of the four planes, two were five-years-old and were at US$18,5 million each and the other two were selling for US$16,5 million each. The oldest was 11-years-old and in aviation, those are considered fairly new. We agreed that they could start servicing them and rebrand them in our colours. We organised to go back for a test flight when they were done with the first one. We went for the test flight and that is when all the trouble began. Upon landing, the whole world knew about Air Zimbabwe buying planes. The news was that they were going to be impounded by people we owe money. So we were advised by PWC on how to go around the issue by registering a leasing company. We came and sold the idea to then President Mugabe and he instructed us to go and see then Vice President Mnangagwa, because he would know what to do. We then went and saw the then Vice President and told him what had happened. Mnangagwa then called in Chinamasa as Minister of Finance and Mangudya. We resolved that we form a leasing company where Mangudya would be the trustee and the government's representative. The company directors would be from the Transport Ministry. Zimbabwe Airways had been registered in 2012 and the directors were drawn from the ministry. The problem came with having directors who were government employees; this showed that we owned the company. That is when we removed them and appointed new people with Mangudya remaining the trustee. We went back to the State Procurement Board to regularise the issue of the planes which were now supposed to belong to Zimbabwe Airways. We, however, had to keep this a secret and told the public that the airplanes belonged to Zimbabwe Airways, which was supposedly a private company. We did this to manage perceptions and protect the planes from being impounded. After the new dispensation (following military ouster of Mugabe last November) came, the new President Mnangagwa said we were re-engaging with the former white farmers and we had agreed on payment plans, so the planes would not be impounded. There was then no need to hide behind the Zimbabwe Airways narrative. We were directed to take delivery of the first plane. Chinamasa and myself were tasked with informing the nation that the Zimbabwe Airways story was a cover-up and sanctions-busting story. There was no longer need to keep hiding the planes; we had to tell the people that the planes belonged to the government. What is interesting is that after refurbishment, the plane was re-evaluated and its value had risen to $140 million. So far, three have been paid for but we are yet to finish paying for the last one. On the issue of Simba Chikore, he was Air Zimbabwe's COO so he was representing the airline's interest in the negotiations. After the matter became public, we advised him to resign from Air Zimbabwe to remove any connections with the airline in the deal. By then he was serving notice of his resignation and he was going to the Zimbabwe Airways section because he was well qualified to do so."